Justin Peck put a gun to his head and pulled the trigger, but it didn’t go off. The rush he got in that moment is what probably saved his life. That’s the day he knew he was bulletproof. Like all of us, Justin Peck was born normal. But he didn’t allow himself to stay that way. He chose to become a racer, a champion, a survivor. A few, like Justin, break out of the pack and become great, even extraordinary. What is it that allows these people to not accept the everyday, basic, run of the mill? What makes them become outliers? Justin didn’t know he was out of the ordinary — and even today, he’ll tell you he’s just a regular guy who started from nothing. Being normal was going to be a stretch. As a child, he was the little guy, the one bullied, isolated and left without a voice among his peers. In that world grew the resilience, the focus and the heart of a champion. By his teens, Justin found himself fearless and addicted to an adrenaline rush. He began referring to himself as “bulletproof,” a nickname his mother didn’t love, but he felt was innately fitting. The moment he knew he would be a racer came when he was 17 at the track with his father. In the cacophony of the fans and the roar of the cars, he told his father, “That’s going to be me one day.” He became a father at 18. He rode in his first race at 20. He was diagnosed with bipolar disorder at 26, a condition he’s had since he was 13. The constant force was that he was unstoppable — he was bulletproof. How does a man go from normal to a champion? He outworks everyone around him. When asked about his own superheroes, he’ll quickly tell you that he doesn’t look to the outside world for inspiration or a roadmap, he turns to himself. He looks at his own true north, who he is, who he wants to be and how can he better than the day before. “Anything worth doing is worth over-doing; moderation is for those who don’t believe in their abilities,” he says. “There’s no reason to do anything half-way. I’m going to go 100 percent all the time and if I’m not willing to put in 100 percent, I’m not doing it.” That mantra has driven him to be a successful entrepreneur who’s launched brands, built businesses, trademarked innovations and created championship racing teams. “I run my companies like I drive a race car… fast and out of control.” Three years ago, he learned a new motorsport and new track surface and quickly rose to the top. Again. On any track and any given day, Justin is the first to arrive and the last to leave, whether he’s practicing or signing autographs. It’s that heart, that passion and that tenacity that allows him to use the gift of a second chance. What does a man with such heart and a full-throttle approach take on next? 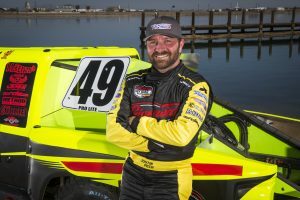 Justin currently races and runs several companies in Utah where he lives, along with his four children, ages 10 to 23, and one baby granddaughter.